It's time to say goodbye to a busy, memorable, and extremely hot summer. While I'm coming away with fond memories (our honeymoon, Blue Hill at Stone Barns, 4th of July, Cape Cod), I'm relieved to see the leaves begin to change and nighttime temperatures dip into the 50s. Unfortunately the end of the summer also signifies the end of ripe tomatoes, juicy peaches, vibrant sunflowers, overflowing bins of okra, and deep purple eggplants. Summer produce season is but a brief blip each year--the one period when so much is in season that I don't have enough time to make everything I want! In fact, Justin and I had this discussion this week: What ingredient did we eat a lot? What did we really not use and wish we had? We're satisfied with how many heirloom and cherry tomatoes we ate, the interesting ways we cooked with eggplant, the 'peach a day' rule that seemed to be the norm during July, and how much we incorporated zucchini and corn into our meals. On the flip side, we completely missed blueberries and watermelon and never got around to cooking with okra! This past Sunday, we walked down to Carroll Gardens for brunch at Seersucker and shopping at the Carroll Gardens Greenmarket. That morning, I had flipped through my new favorite cookbook (that trophy seems to change all the time): Harvest to Heat. While in McNally Jackson on Saturday (with their too-tempting displays of books) I wandered into the rearranged food book section. Except for Harvest to Heat, the other cookbooks were familiar to me. I grabbed the cookbook and started browsing, quickly becoming engrossed with the photography, layout, and recipes. 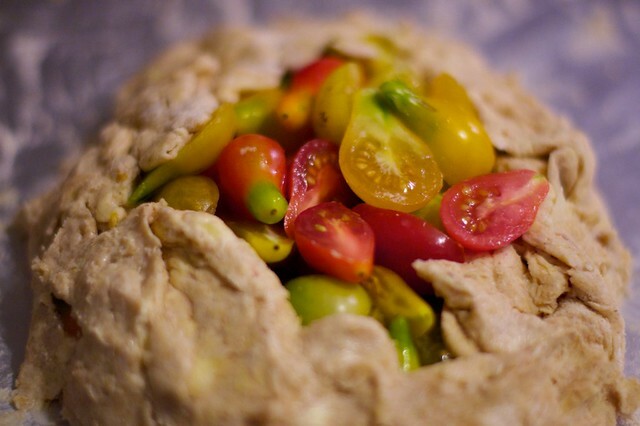 Especially the front cover picture of the heirloom tomato galette. Clearly other people were as captivated by this picture as I was--I chatted about the book with the a bookstore employee and my waiter at Savoy. Also--I bought the last copy. The book is written by Kelly Kochendorfer and photographed by Darryl Estrine, two people with some seriously amazing connections. It's a who's who of the food world: collaborations with the best seasonal and creative chefs and many farmers and artisans with whom I'm familiar. As an added bonus I now I have a quick guide to restaurants throughout the country, for regions I haven't explored yet. Since I first picked up the book because of the tomato galette picture, by now you should know what we made on Sunday night. Luckily, thanks to this summers' dreadful heat, there were still plenty of tomatoes to be found at the market. 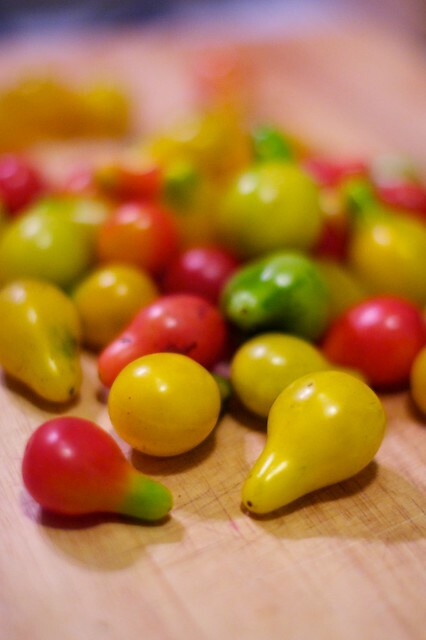 We bought beautiful heirloom cherry tomatoes from W. Rogowski Farm, extra flour from Farmer Ground Flour, and stopped at Union Market for everything else. It may sound strange--and maybe no one will ever ask me this--but if someone were to ask me about my favorite thing to make, I would immediately say a galette. Two of my favorite things I've ever made are a butternut squash galette and a zucchini galette. This recipe is now in my top 3. The galette crust contained creme fraiche instead of butter, which made the crust biscuity and quiche-like. The manchego cheese melted and mingled with the roasted tomatoes. Once again, as is the case with every galette I make, I regretted making just one. 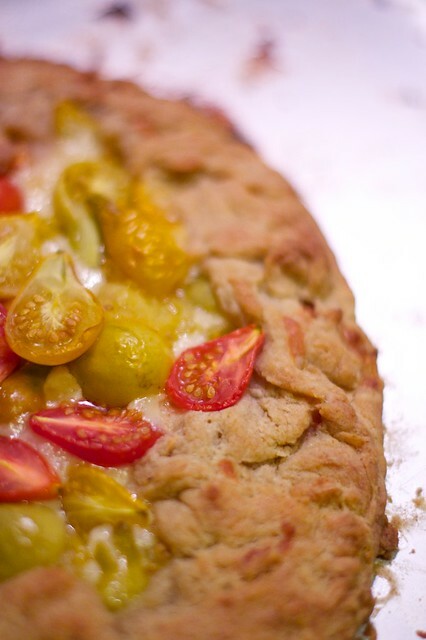 If you can still find heirloom cherry tomatoes, I recommend picking up a pint and baking this galette as soon as you can! Make the dough: Combine the flour, salt, baking powder, and butter pieces in a bowl. Blend (by hand with a pastry cutter or in a food processor) until the butter is incorporated into the dry mixture. Mix the creme fraiche in, but don't overmix! Gently push the mixture together in a pile, wrap tightly with plastic wrap, and refrigerate for 2 hours. Make the filling: Sprinkle salt on the tomatoes. Lay them on a paper towel and let drain. Heat the oven to 425. Dust a work surface with flour and roll the dough into a 12-inch round about 1/4 inch thick. Slide a baking sheet under the dough. Leaving a 3 inch border, scatter the cheese on top of the dough, then arrange the tomatoes evenly over the cheese. 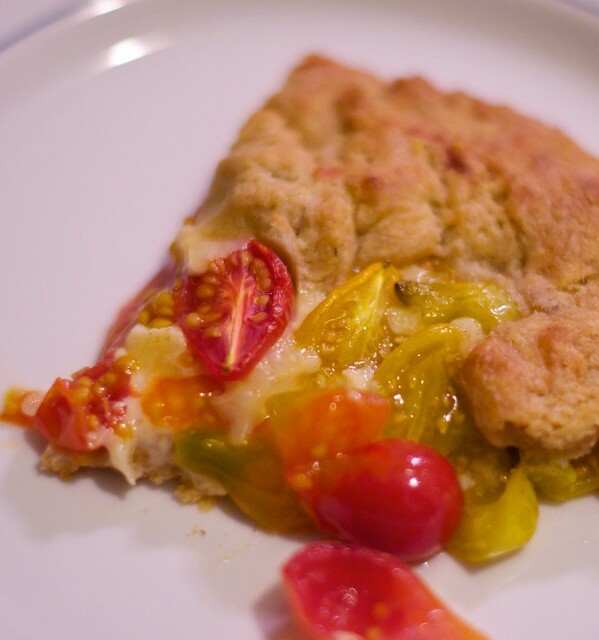 Fold the edges of the dough over the tomatoes, making pleats and leaving the center of the tart open. Bake the galette until golden brown-30-40 minutes. Let cool. Besides a week-long stretch when I was sick and lay on the couch watching the entire first season of Grey’s Anatomy, The Great British Bake Off is the closest I’ve ever come to obsessively binge-watching a tv show. Ever since returning from our October trip to Venice and Slovenia, I’ve been unable to stop baking.